First shot of the season in the constellation Orion! I set up the AstroTech RC scope (6"/152mm aperture f/9) with my narrowband imaging train, Atik 414EX, ZWO filter wheel with Clear, Ha, OIII, SII & IR685, William Optics 0.8x field flattener/reducer that brings the AT6RC to f/7.2 at 1080mm focal length. With the Atik's 6.45μ pixels this has my resolution at 1.23 arcseconds per pixel, and a field of view of 0.48° x 0.36°. Here are some shots of my set up last night, before nightfall, and in the middle of the narrowband run with 600-second exposures. The 1000mm+ focal length did get me wonderfully close to the Horsehead Nebula (B33) and the reflection nebula NGC 2023 (bottom left) in the constellation Orion. This is what 46 stacked 600 second hydrogen-alpha frames will get you if you stretch things a bit too much and don't use any calibration frames. That would reduce the noise/graininess somewhat. Anyway, pretty happy with this. (46 x 600 second exposures in Ha, Atik 414EX mono CCD at -10C, Astronomik 12nm Ha filter, AstroTech AT6RC f/9 Ritchey-Chrétien + WO Flat6A f/7.2, iOptron CEM25P EQ mount, Orion OAG + ZWO ASI120MM-Mini guide cam, Stellarmate OS (INDI/KStars/Ekos) running on Raspberry Pi 3b+. Stacked in DSS, processed in Photoshop CC 2019). I stretched the hell out of this stack of 46 x 600 second subs, mainly to see what the data would show if I went out of my way to bring out the details. I also didn't use dark frames with this--so that's worth a try. The Atik 414EX at -10C or cooler is very clean, though. I usually don't gain a lot with calibration frames, but in this case even a little will improve the noisiness. I don't use the AT6RC scope that much, mostly because when paired with the cameras I have the resolution is oversampled crap. The Atik is the only one that's right in there at 1.23 arcseconds/pixel, and that's with the 0.8x field flattener/reducer. Another point (or set of points) I would like to make is the Astro-Tech 6" f/9 Ritchey-Chrétien is a $400 scope, and I'm pretty impressed with the light and contrast it managed to pull out of the night sky. Some of the credit certainly goes to the Atik CCD, which really is an amazing little camera. The sub-$1000 iOptron CEM25P has no problem with long exposure times. Along with the $129 12nm Astronomik Ha filter, this is a very inexpensive narrowband setup. The point being you don't need to spend a raft-load of cash to start capturing those beautiful HII regions, supernova remnants, and other wonders in the night sky. 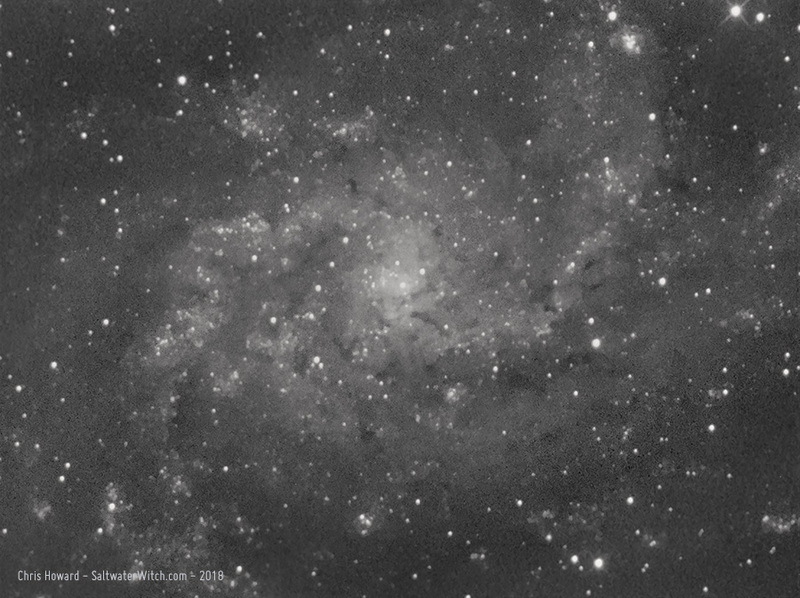 Okay, I also took some subs of the Triangulum Galaxy core (M33) while setting up and getting into focus--testing out shooting in 2x2 binning, which reduces the resolution by half.